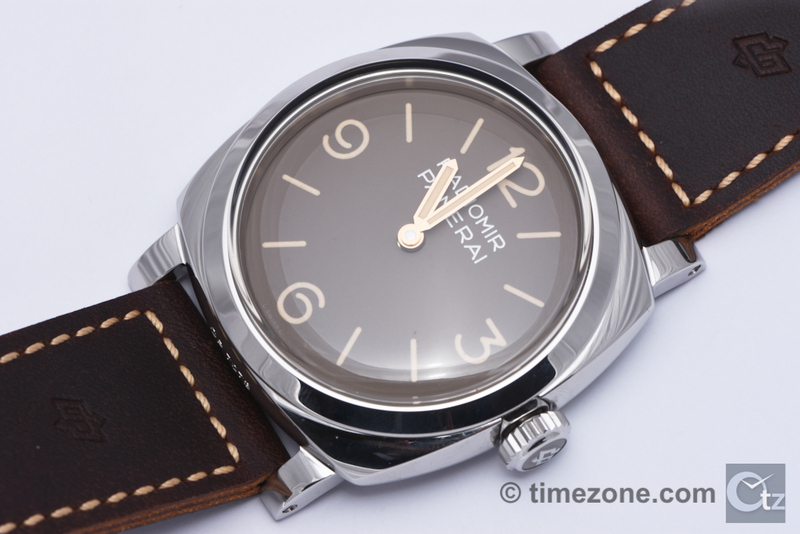 For 2016, Officine Panerai presents nine references that range from contemporary high-end watchmaking, historically influenced timepieces, and immediately recognizable timepieces. As of today, there is only an unofficial pricing guide for internal purposes; however, official pricing is still being worked out and the US price list is not yet published. Lo Scienziato Tourbillon Titanio PAM578 has a lightweight 47mm titanium case and deployant buckle on an anthracite alligatnor strap. 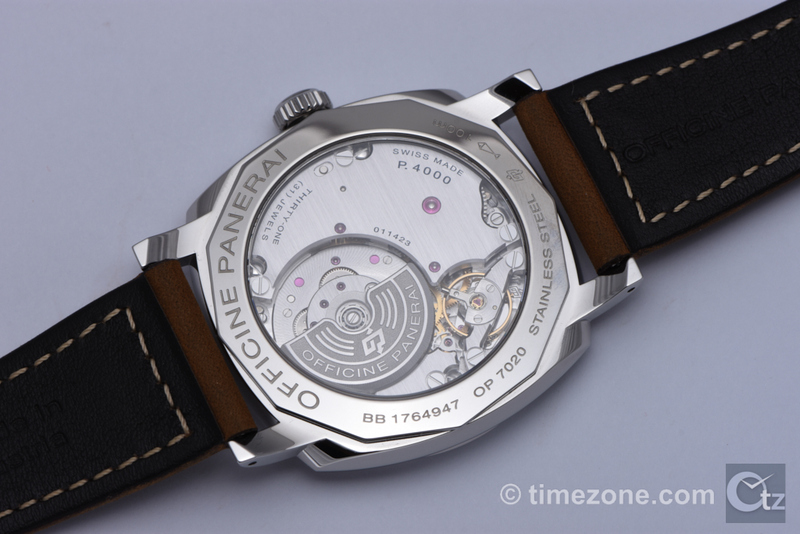 The watch features Panerai's in-house caliber P.2005/T skeletonized hand-wound movement with 6 days power reserve. The watch has a skeleton dial with a small seconds subdial at the 9 o'clock and a second time zone at the 3 o'clock. 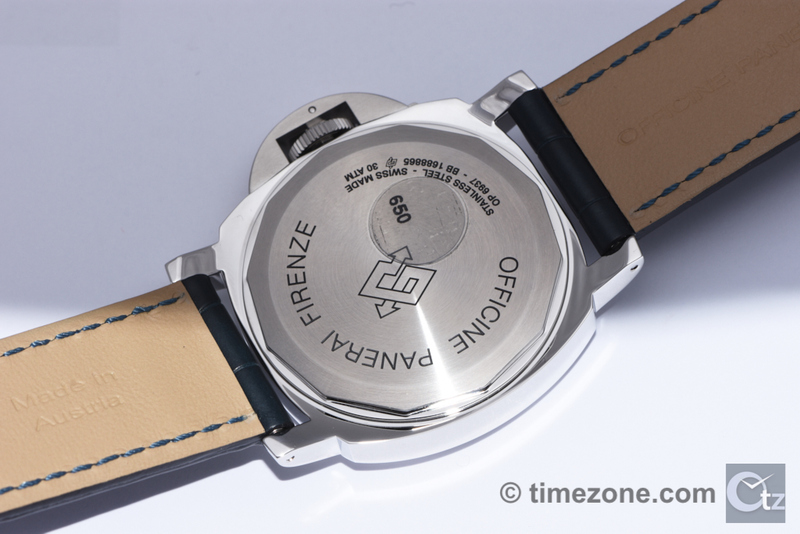 The power reserve indicator is located on the back of the movement with a power reserve of 144 hours. Water resistance is 100 meters. 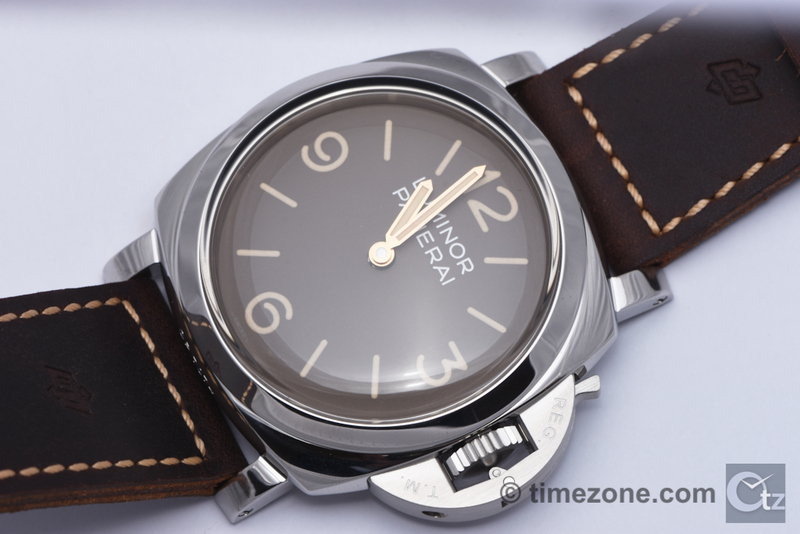 PAM578 is a limited edition of 150 pieces. Announced in advance of SIHH 2016, the new Radiomir 1940 3 Days Automatic PAM655 is the first Radiomir 1940 with a white dial. 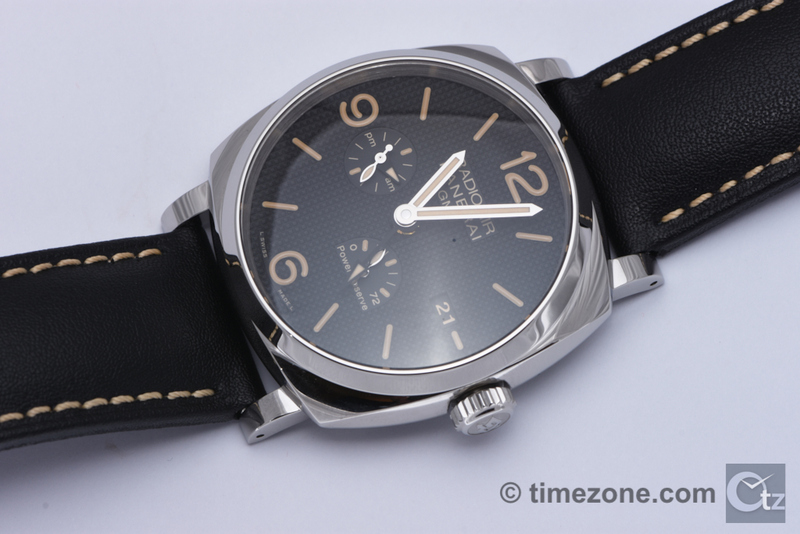 PAM655 is powered by the in-house calibre P.4000 automatic movement with micro-rotor and a 72-hour power reserve. 42mm stainless steel cushion case is 10.93mm thick and fitted with a brown calfskin strap with contrast stitching and ardillon buckle. Dial is white with black arabics and luminous dot markers, and smalls seconds at 9 o'clock. Water resistance is 100 meters. 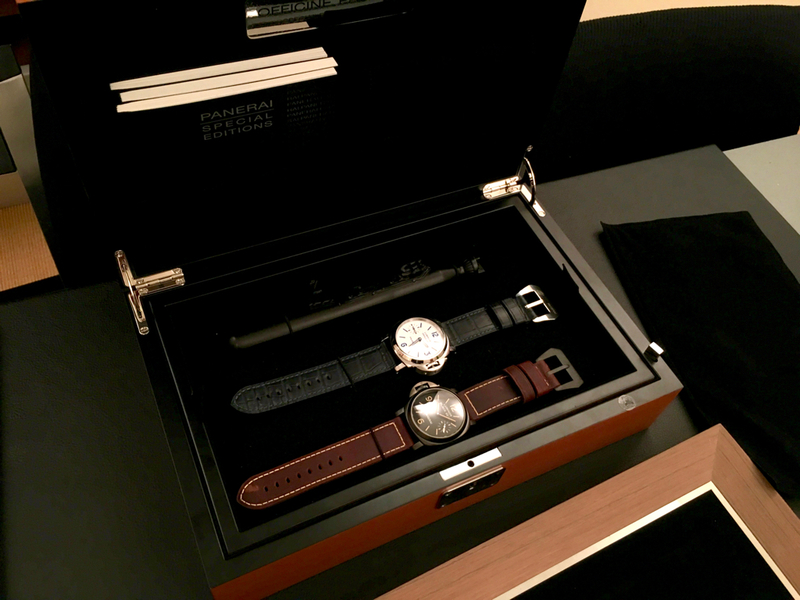 The Luminor 8 Days special edition set includes a Luminor Black Seal and Luminor Daylight PAM786. 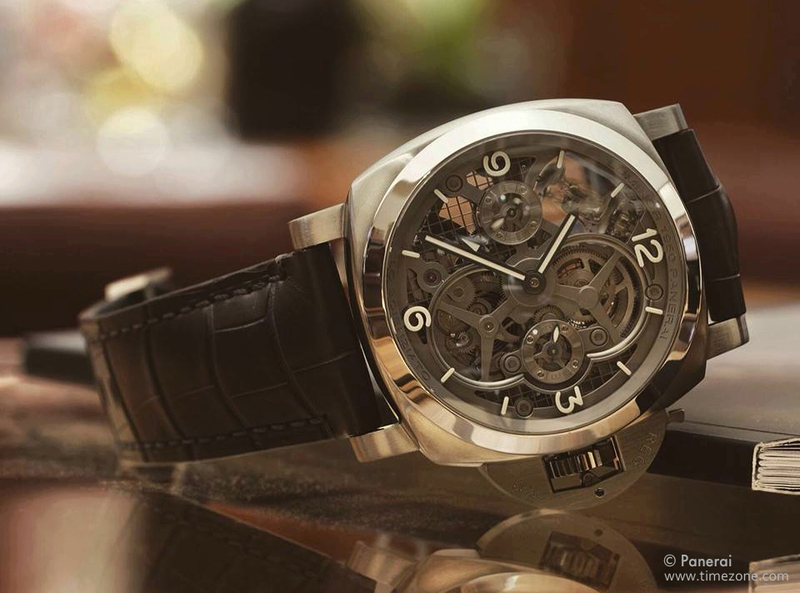 The Luminor Black Seal is a Destro powered by the calibre P.5000 hand-wound movement. 44mm stainless steel case with black DLC coating on brown calf strap with contrast stitching and ardillon buckle. 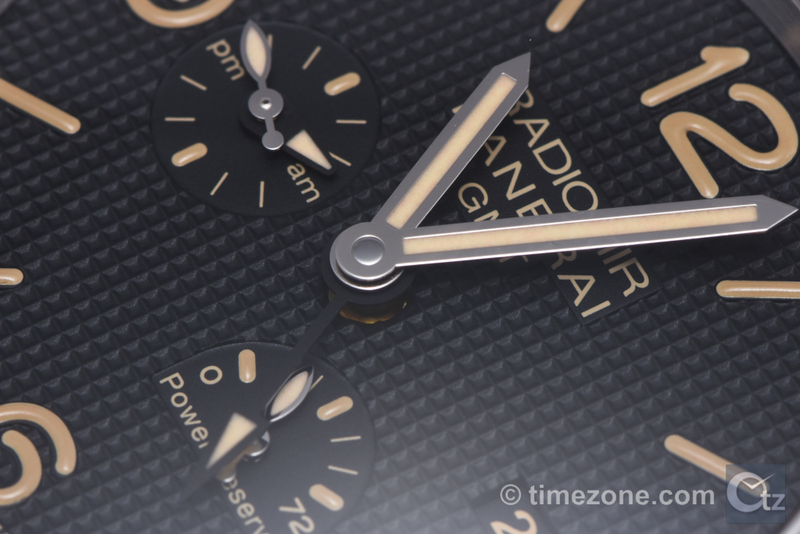 Black dial with luminous arabic and stick markers has a small seconds at 3 o'clock position. Power reserve of 192 hours. Water resistance is 300 meters. 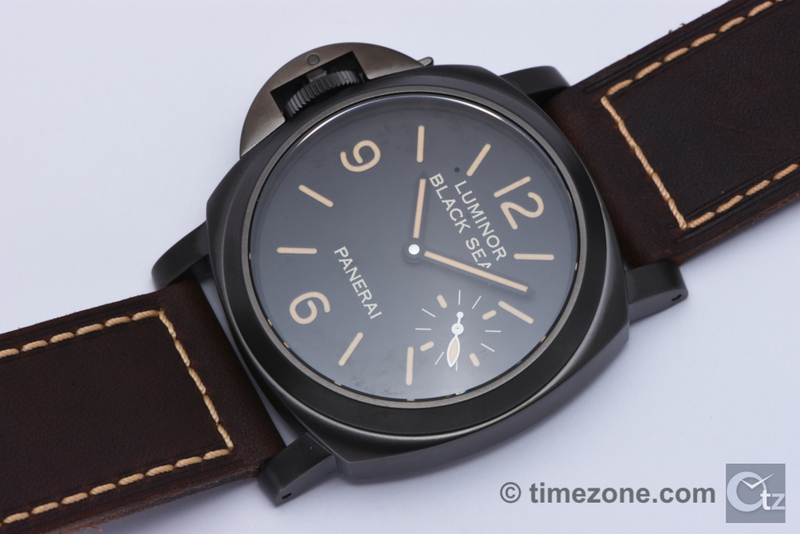 The Luminor Daylight is powered by by the calibre P.5000 hand-wound movement. 44mm stainless steel case on blue alligator strap with tone on tone stitching and ardillon buckle. White dial with blue arabics and stick markers has a small seconds at the 9 o'clock. Power reserve of 192 hours. Water resistance is 300 meters. The Luminor 3 Days Acciaio PAM663 has a 47mm polished stainless steel case with a brown dial and luminous arabic and stick markers. 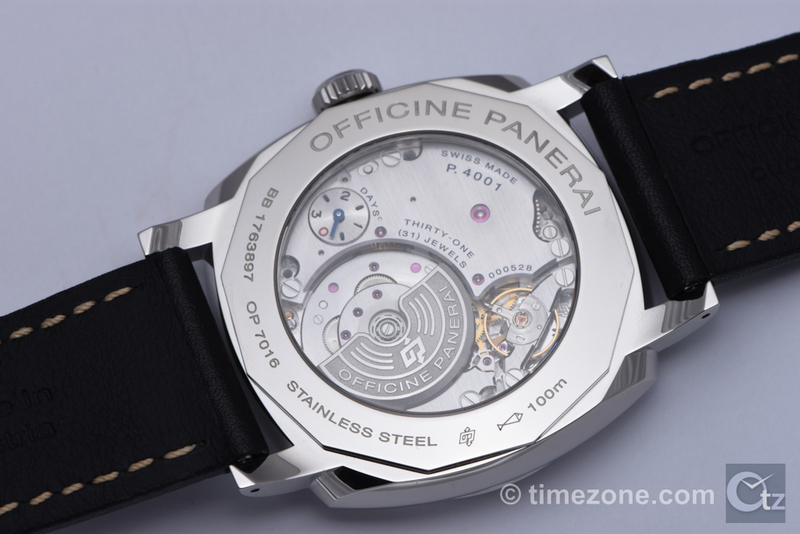 The timepiece is fitted with the calibre P.3000 hand-wound movement with 72-hour power reserve. Water resistance is 100 meters. Limited edition to 1,000 pieces. The Radiomir 3 Days Acciaio PAM662 has a 47mm polished stainless steel case with a brown dial and luminous arabic and stick markers. 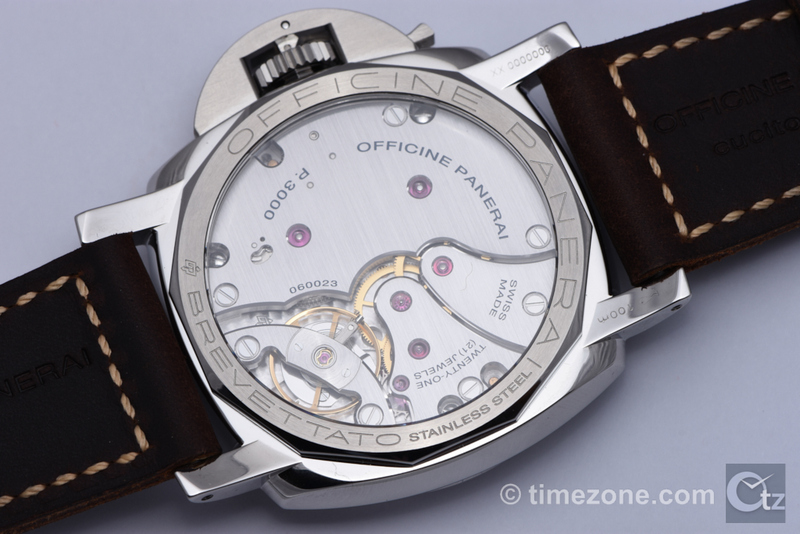 The timepiece is fitted with the calibre P.3000 hand-wound movement with 72-hour power reserve. Water resistance is 100 meters. Limited edition to 1,000 pieces. The Radiomir 3 Days GMT Power Reserve Automatic Acciaio PAM628 is powered by the in-house calibre P.4002 automatic movement. 45mm stainless steel case on black calf strap with contrast stitching and ardillon buckle. Dial features a "clous de Paris" finish with date aperture at 3 o'clock, seconds and 24 hour indicator at the 9 o'clock position, and a 72 hour power reserve indicator at 5 o'clock. Water resistance is 100 meters. The Radiomir 3 Days GMT Automatic Acciaio PAM627 is powered by the in-house calibre P.4001 automatic movement with micro-rotor. 45mm stainless steel case on black calf strap with contrast stitching and ardillon buckle. 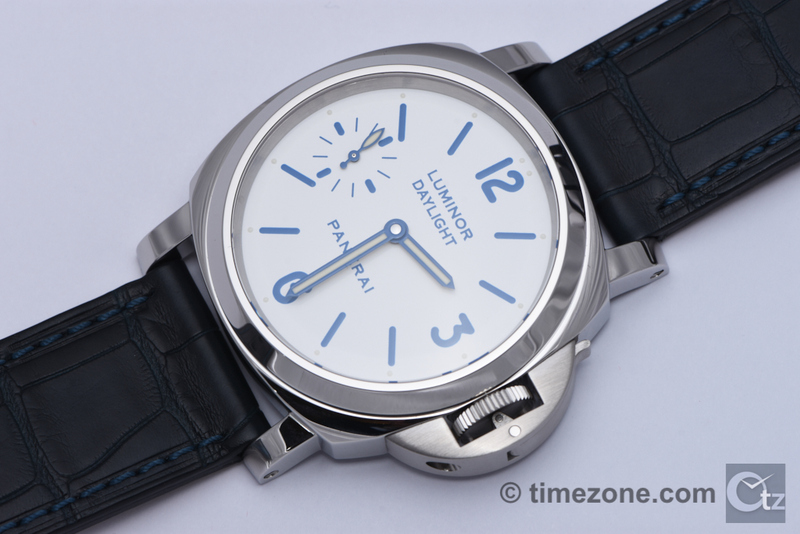 Dial has clous de Paris finish with date aperture at the 3 o'clock, and an am/pm indicator for the second time zone at 9 o'clock. The 72-hour power reserve indicator is on the movement plate. Water resistance of 100 meters. 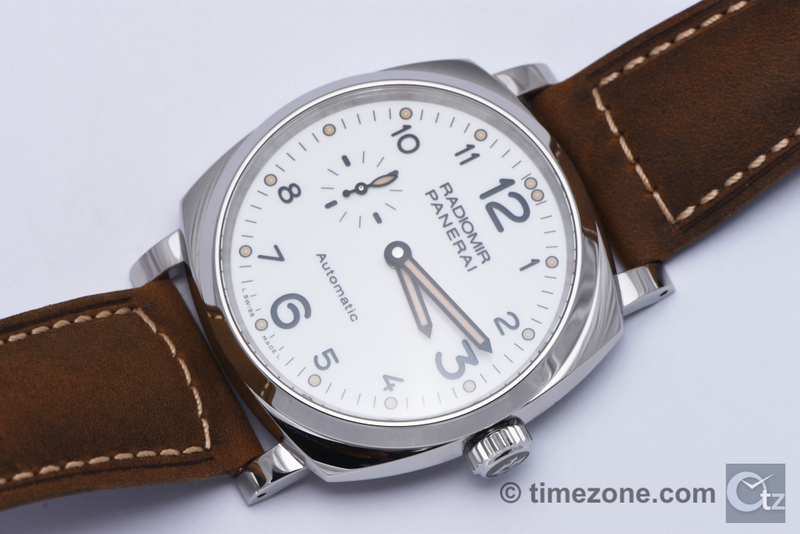 Radiomir 3 Days GMT Automatic Acciaio PAM657 is powered by the in-house calibre P.4001 automatic movement. 45mm polished stainless steel case on brown calf strap with contrast stitching and ardillon buckle. The black dial features a vertical stripe finish with date aperture at the 3 o'clock, and am/pm indicator for the second time zone at the 9 o'clock position. The 72-hour power reserve indicator is on the movement plate. Water resistance is 100 meters. 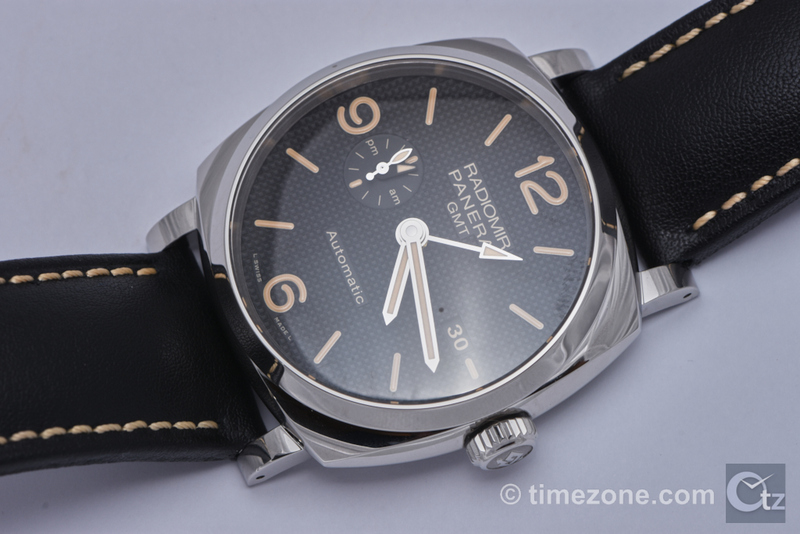 Radiomir 3 Days GMT Power Reserve Automatic Acciaio PAM658 is powered by the in-house calibre P.4002 automatic movement. 45mm stainless steel case on brown calf strap with contrast stitching and ardillon buckle. Dial has black with a vertical stripe finish with date aperture at the 3 o'clock, seconds and 24 hour indicator at the 9 o'clock position, and a 72 hour power reserve indication at the 5 o'clock position. Water resistance is 100 meters. Next Topic: Rubber tone on tone strap? ?